Railpictures.ca - Ryan Gaynor Photo: For the second year in a row, Canadian Pacific has tasked one of only two locomotives in original Delaware & Hudson paint to their annual spray train. Here, D&H 7303 negotiates one of the many curves at Waterdown, Ontario as the train descends the Niagara Escarpment on the Hamilton Subdivision. | Railpictures.ca – Canadian Railway Photography – photographie ferroviaire Canadienne. Caption: For the second year in a row, Canadian Pacific has tasked one of only two locomotives in original Delaware & Hudson paint to their annual spray train. 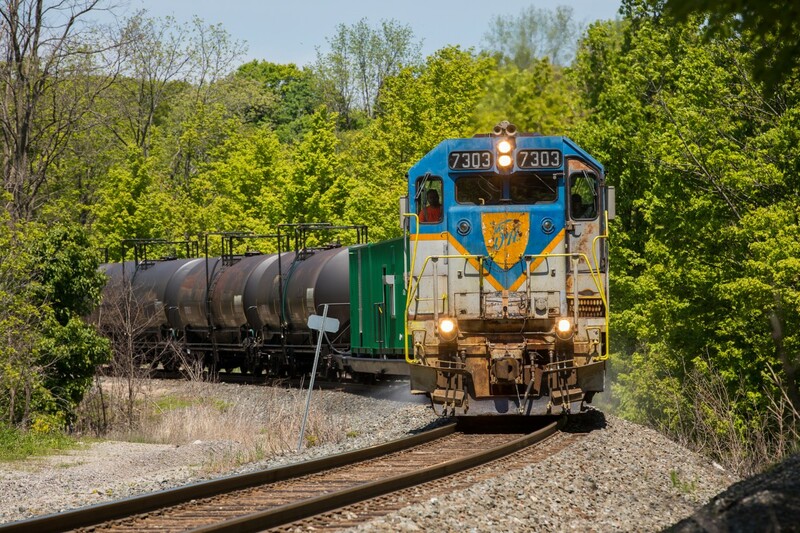 Here, D&H 7303 negotiates one of the many curves at Waterdown, Ontario as the train descends the Niagara Escarpment on the Hamilton Subdivision. Nice shot Ryan! @BradKetchen: I’m not sure about the tradition…I just know it ran last year, similar to this trainset, but slightly different, which makes it really cool…7303 vs 7304 and slightly different cars in behind. Maybe other years it ran with usual CP power? The train experts can fill us in I’m sure. Why the D&H loco for the weed train? Some sort of tradition? Great shot as always Ryan.